I have been worried about the noises coming out of the transaxle on my Porsche 944 track car. Based on his excellent reputation, I decided to remove the transaxle and send it to Kevin Gross at Catellus Engineering for a rebuild. Note that the 944 uses a “transaxle” which is located at the rear of the car and is a combination of transmission and differential. This design gives the 944 very close to a 50:50 weight balance. But before I get into the details about the rebuild, here is some background regarding Kevin. Kevin worked for many years as a management consultant for web and IT type projects. He was able to purchase a 944 new back in the 80’s. This led to an interest in Porsche club racing. He started helping out in his spare time at a local race shop. One of his first jobs was helping incorporate a custom engine management system into a 911 race car, which required the use of a laptop. Kevin provided the IT expertise. 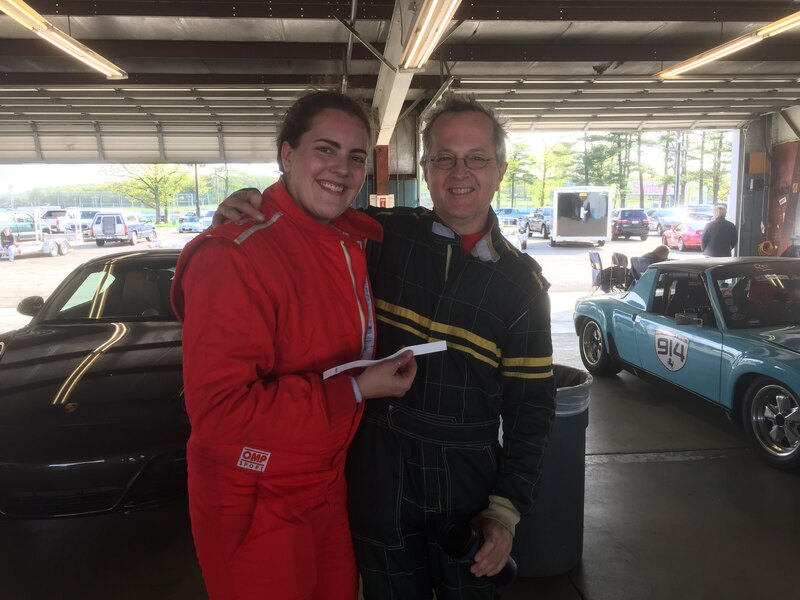 He continued helping with the race shop on general Porsche work and at some point learned how to rebuild Porsche transaxles. He educated himself by reading factory literature and books published by the Society of Automotive Engineers. And he learned by having a willingness to observe others and being willing to try the work. 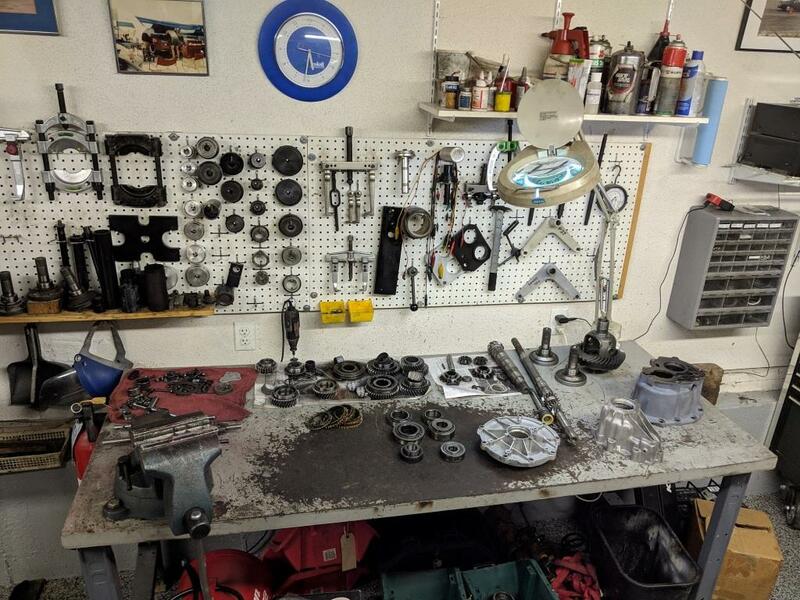 Kevin notes that rebuilding transaxles does require a lot of specialty tools, as indicated by the service manuals. 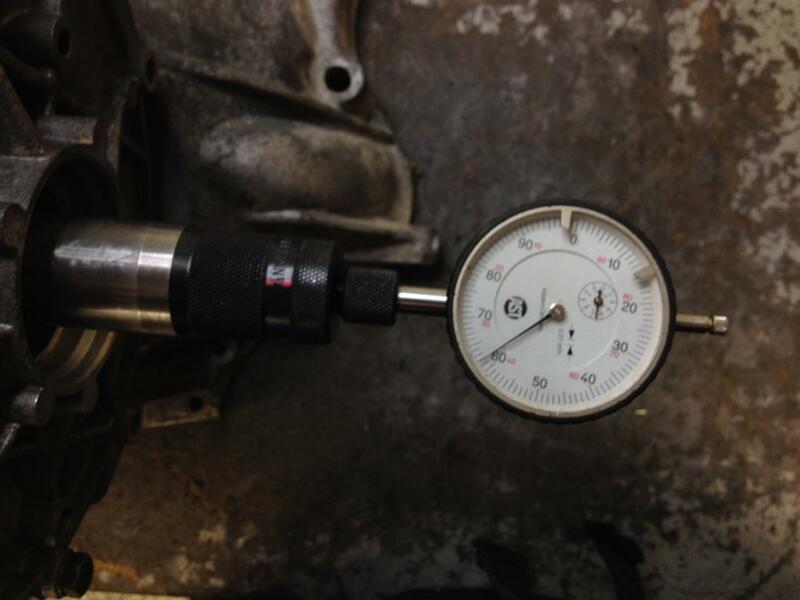 Some you absolutely need to do the job, with the depth gauge for setting the pinion being a good example. Some you have buy, some you can make yourself. It’s a mixed bag. 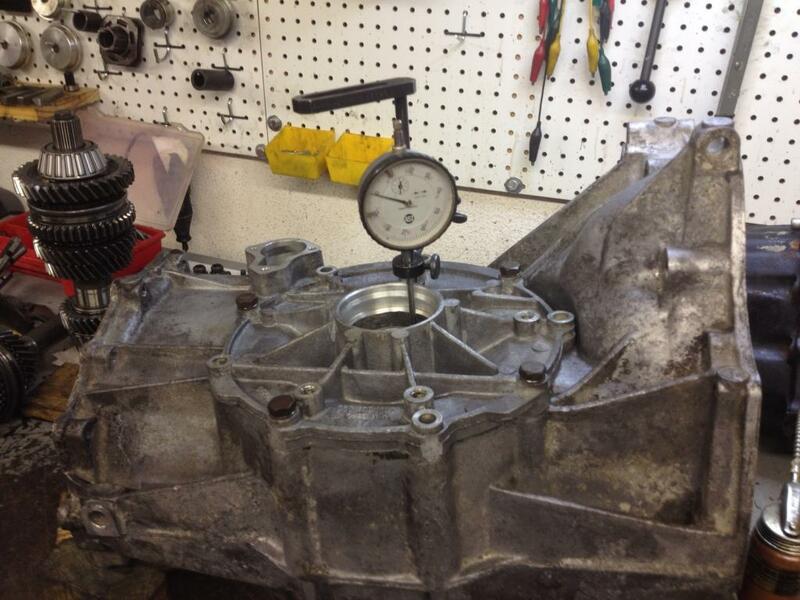 Currently, Kevin has developed the skills to rebuild Cayman and Boxster transaxles. Kevin has driven on track for 30 years. He has been an instructor for PCA and BMW for 25 years. He has been involved in club racing in a support role. Kevin and his student at the PCA Zone 1 48 hour event. Regarding the rebuilding of my specific transaxle, the transaxle on my track car is a used unit that I installed a few years ago after my previous transaxle started making “rock crusher” noises during a DE weekend. My current transaxle has some pretty loud gear whine especially on de-acceleration. 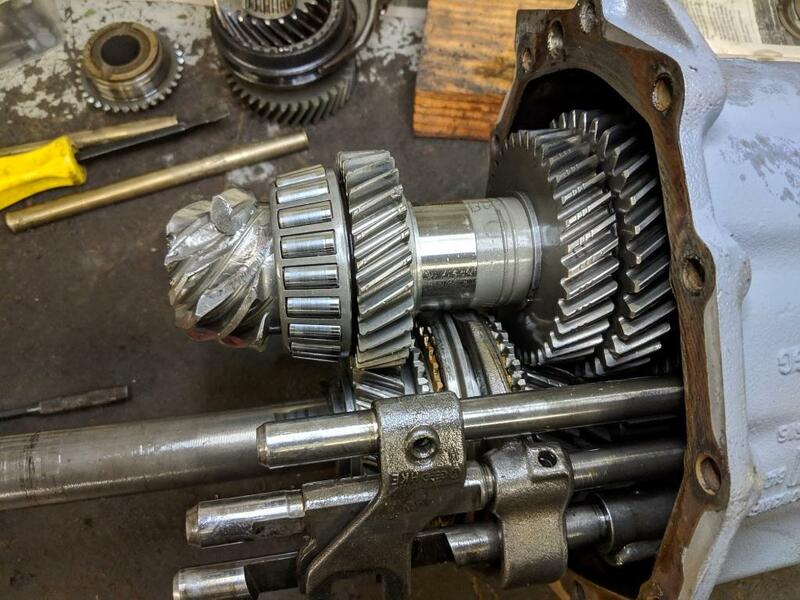 I contacted Kevin and he suspected that a bearing on one of the shafts was worn and allowing the gear mesh to get out of alignment. 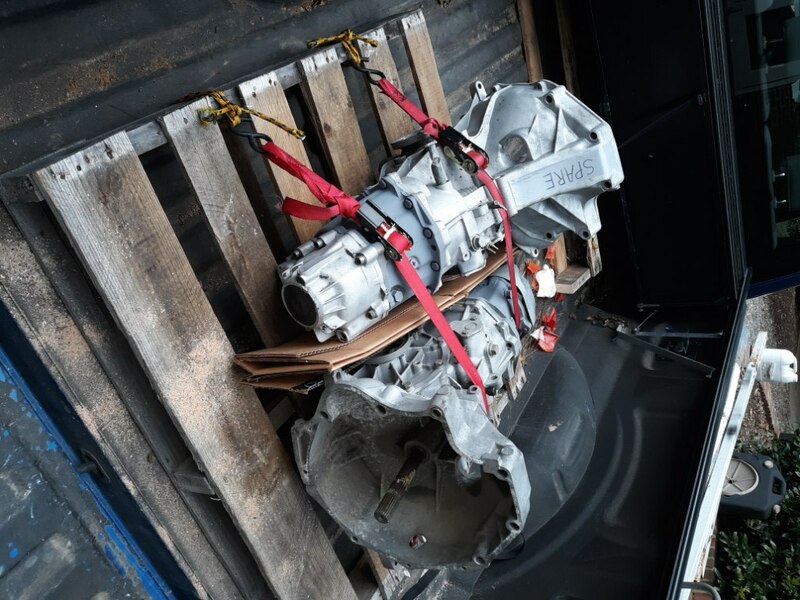 I took out the “good” transaxle and sent it on a truck freight pallet along with the “bad” transaxle to Kevin. 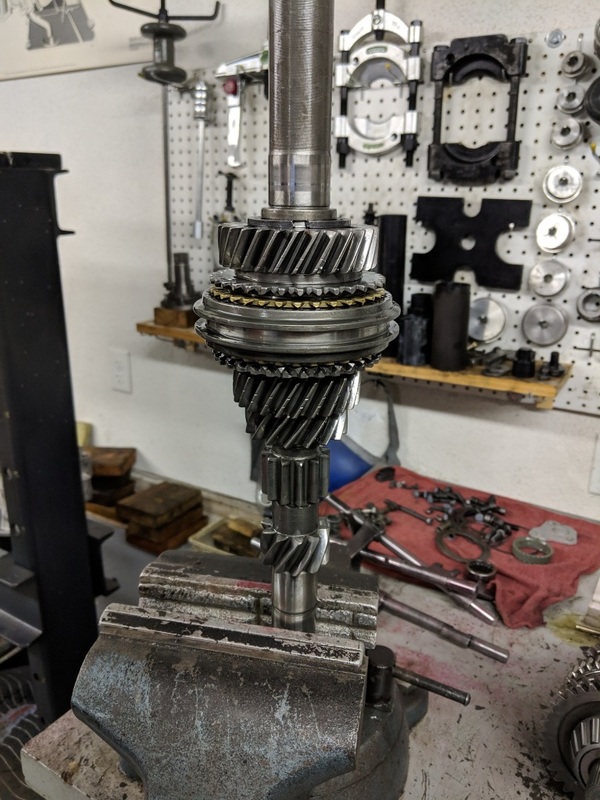 Kevin found a bearing that was no longer a press fit in the transaxle case, allowing the bearing to move, and generating the noise. 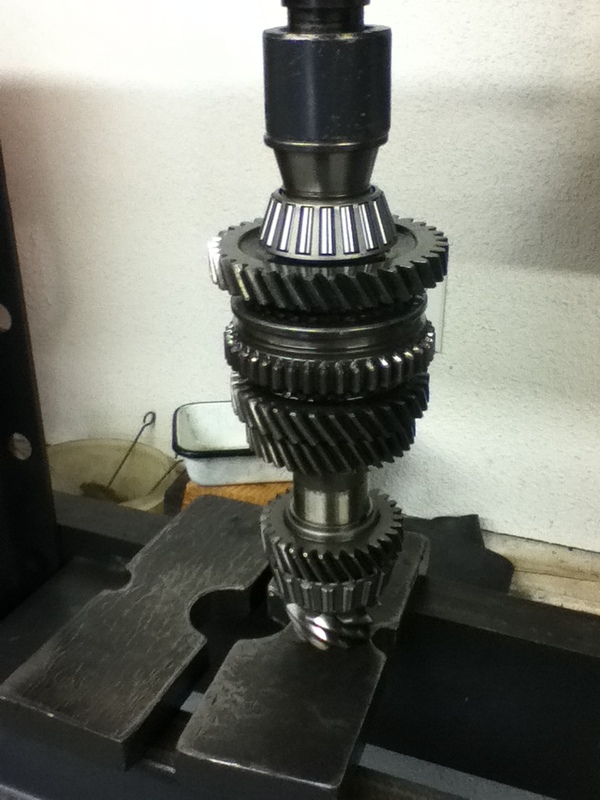 On the bad transaxle, you can see the damage to the pinion gear in the photo below. It turned out neither transaxle had a good front case. In what I consider to be a minor miracle, Kevin has access to new front cases at a very reasonable price. He also sourced a used “short fifth” gear which he installed. 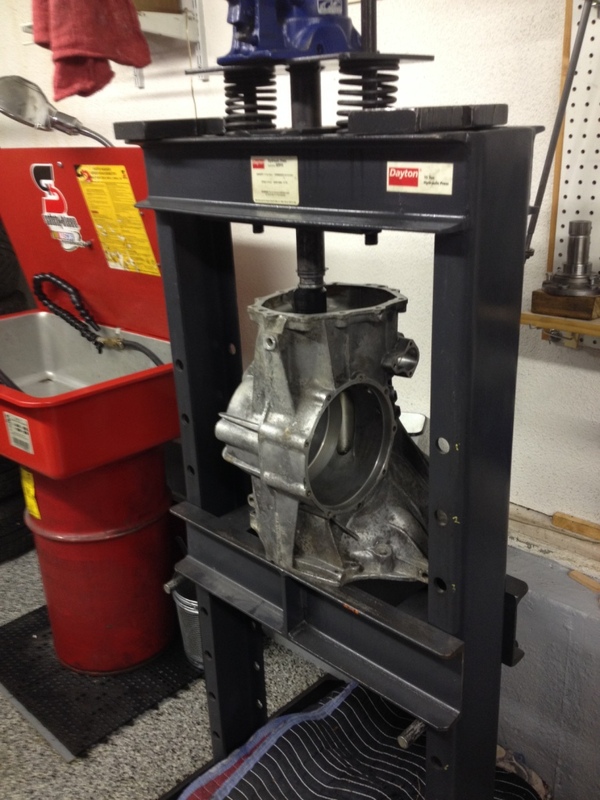 There are over 35 line items on the parts list so there is a lot that goes into a good quality rebuild. 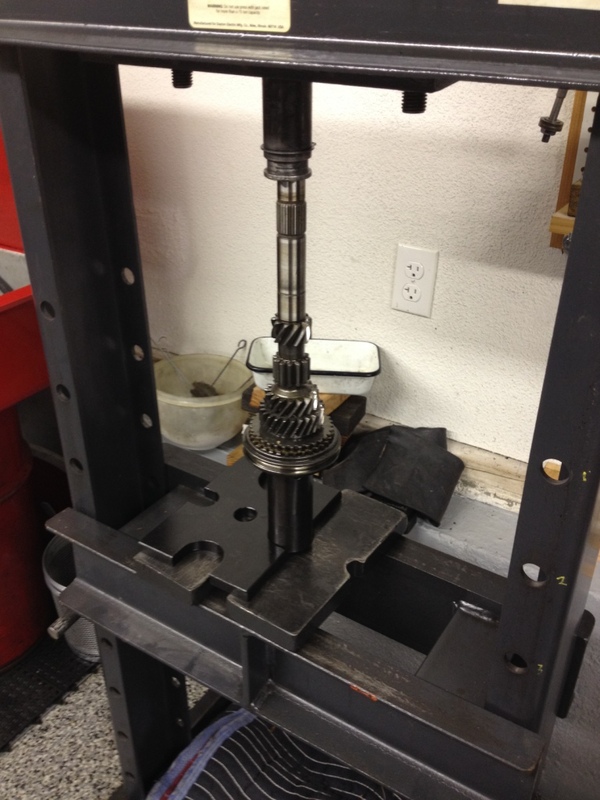 I have installed my rebuilt transaxle in the track car. I also did an R&R on the constant velocity joints. 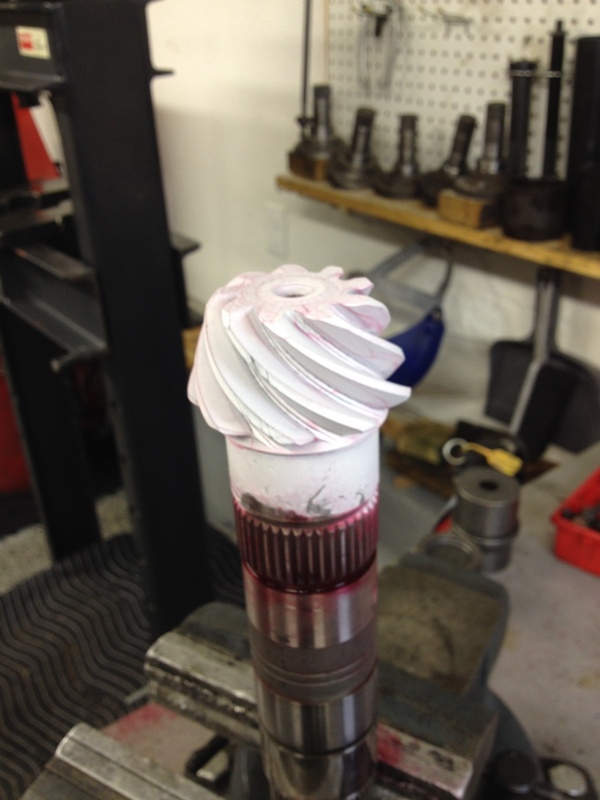 The happy result is a quiet running, smooth shifting transaxle. Money can buy happiness! 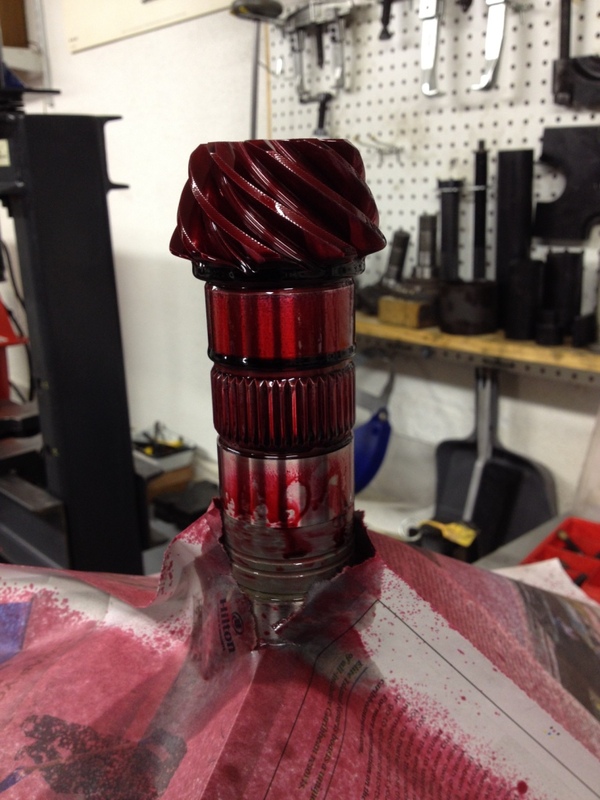 Red dye applied as part of a dye penetrant check for cracks. White developer applied as part of a dye penetrant check for cracks. Transaxles strapped down and ready for truck shipment. 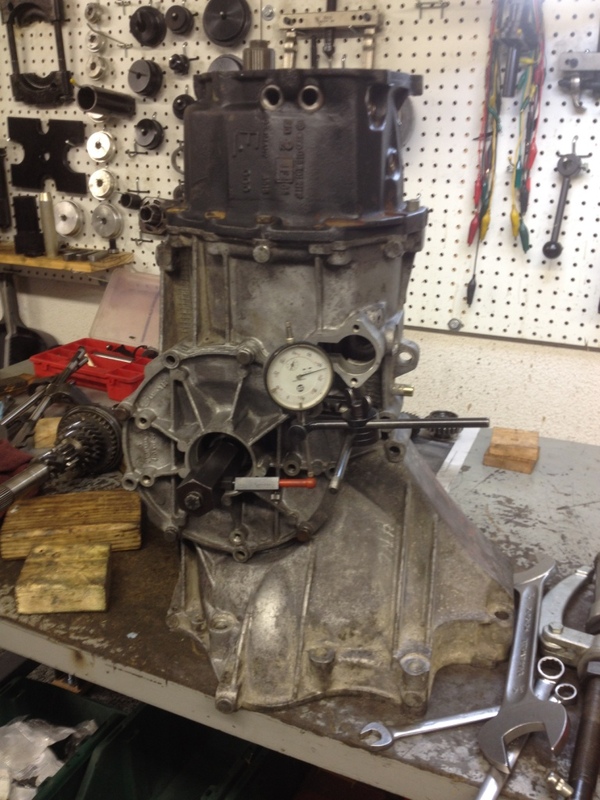 Here is a link to an interesting article by Van Svenson about the Porsche 944 transmission. This article is also quite informative. Alternatively search on Transmission Walkthrough on Rennlist.